Call me strange, call me a nerd, but when it comes to alien movies, I’m almost always game. Now, I never knew what The Signal was about before watching it, as the trailer itself is more or less vague in that department, but it still looked good enough to watch, and it constantly kept my interest – plus, for a movie I hadn’t really ever heard of until I watched it, it had a surprisingly recognizable cast…so there’s that. The plot of the thing revolves around a group of three friends, more or less led by a guy named Nic (Brenton Thwaites). As the movie begins, you notice they are on a road trip of sorts, and as it progresses, you realize they are being stalked by some kind of hacker by the name of Nomad. Nomad leads them to an abandoned building – and then everything changes as the group has a blackout. Nic wakes up in some kind of testing facility and is interviewed by a mysterious scientist by the name of Damon (Laurence Fishburne), who claims Nic had come into contact with an EBE – Extraterrestrial Biological Entity – and he was contaminated. Being an MIT student, Nic begins to calculate an escape – but escaping may not be the best idea. This isn’t your typical alien/government conspiracy film, even if it seems like it will be here and there. This is something else, something more creative and more original. Its more interested in telling a mysterious story and leaving messages for the audience to interpret than anything else. It just uses a very strong and very powerful direction in science fiction to get to those messages. Underneath everything, you’ll find a lot about the human will, and our freedom to make choices despite having every logical reason not to – that the will to live and to survive is stronger than anything else. I was intensely intrigued by this film, there’s no doubt about it. However, a lot of the movie does feel like it drags on. It takes them way too long to get to the most interesting element. That element kicks the film into high gear, but before that happens, it feels very slow and laggy…which really hurts the movie. In fact, it starts out and ends just fine, but the middle section doesn’t fit. The first part had a lot of suspense and realism – so the movie could go in any direction. The second part was very intriguing, but moved really slow – and you could probably skip a good portion of the second part – and the third was action-driven with a lot of sci-fi, ending in all of the answers to the questions asked before. The ending was the best part, it just took too long to get there. So it’s not hard to guess that the pacing is a bit iffy for The Signal, but where it falters, it also draws strength in its nonstop mystery and concept alone. 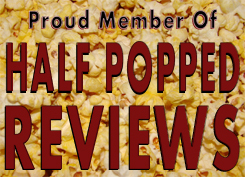 The performances weren’t bad either, but they certainly weren’t what drove this film. The “reveals” in the movie were really cool, in a way that sort of made District 9 a success…I don’t know. I just wish the film had some more advertisement than it ultimately got, because I’ve never actually heard of the thing until I watched it – which doesn’t make sense. The graphics and overall visuals in the entire movie were top notch, and all of that together would make a very intriguing trailer…I’m just curious as to how I missed its existence. 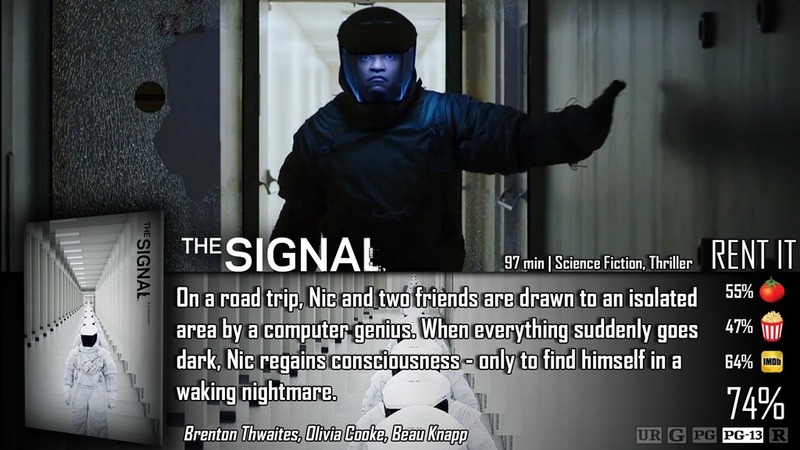 The Signal is different, weird, and I never heard of it before I saw it…but at the same time, it’s unique, creative, and captivating with it’s mystery, suspense, and grasp on science fiction. For the most part, I really enjoyed this flick. As great as the film was, it had a bit of an issue with the pacing. You could almost feel the three parts of the film where the pacing changes. From good start, to really boring mid-section, to exciting finale. That pacing ultimately affected my viewing experience, feeling as if the film dragged on for a bit too long. Good review Dave. It was alright. Very strange and mysterious, and while I don’t think the end totally works, it definitely surprised me in the best way possible.